This is especially true if your booking dates include a Saturday night. If you wait too long, you may have to settle for lodging well beyond Old Town. Many hotels and B&Bs occupy centuries-old historic buildings. Modern preservation codes restrict structural modifications such as enlarging rooms. Preservation dictums also forbid installing elevators. So if you and your luggage will be challenged, verify your room's floor number if there is no elevator. Note: Americans should remember that what they call the "first floor" and "second floor" are named the "second floor" and "third floor" in Europe. Old Town walls if possible. It enriches your Dubrovnik experience and saves commuting time. There is a limited number of accommodations within the walls, ranging from B&Bs to upscale. The 19-rooom Pucic boutique hotel is the best and most expensive. 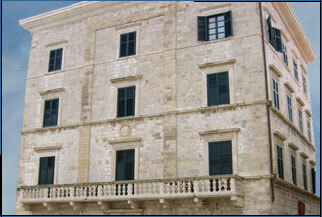 It resides in a centrally located 17th century building (see photo). The Stari Grad ranks number two. The best three within 15 minutes by foot are the Excelsior Grand Villa Argentina and Hilton Imperial.